Faking it one day at a time. So, as I was washing the breakfast dishes (and I'm not gonna mention the time...cough, cough, 6 pm, cough) I began thinking about the giveaways being offered by bloggers around the internet. Since I have won a couple and I always want to give back, I decided I should have a giveaway of my own. I had an empty shoebox just sitting on the kitchen table, don't ask me why it was there, and I decided to fill it with a few new, never been opened items that I had on hand. If you're interested, I'm giving you a chance to win my shoebox. These are the items in my shoebox: 1) a bottle of Oil of Olay hydrating lotion. I have loved Oil of Olay for years! 2) A mini vacuum cleaner for your computer keyboard. 3) a Totes Key Finder. I can never find my keys, or sometimes my car but that's another story. 4) A car pillar pocket to hold your cell phone. Did I mention I can never find my cell phone? 5) A Clorox Bleach Pen. I will randomly pick a winner on February 14th. 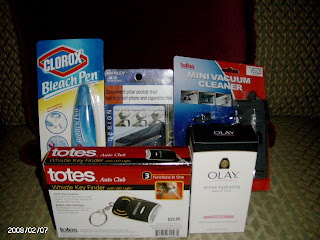 ** All you have to do to win this goody box is leave a comment with an email address. In that comment tell me if you're doing anything special for yourself or someone else on Valentine's Day. I'm making a heart shaped cake for my family and we're all going out to a movie. ** For an extra entry, go hug your kids and tell them you love them. I trust you, just tell me in a comment that you did some hugging. ** And if you want to mention this giveaway in your blog, leave a link back here and you can have another entry. What a neat idea - all great things that I'd love to win - thanks. I plan to make heart cookies for my family and deliver a few to a few elderly in my neighborhood. Thanks! I'm going to give hugs - promise! I think I'll bake cupcakes for the crew here and maybe we'll steal your movie idea! Thanks for entering my giveaway! I plan on making cupcakes with my oldest (he's 4) and frosting them pink and white on Saturday. I am going right now to give my girls hugs, kisses and I love yous! We are all going out for dinner on Valentine's Day. Hugs and love to my children. I just got back from hugging my 5 year old. I try and do that a lot. We don't know how long we'll have her. Two kids in the house to go! Special Valentine's day plans? I've got a surprise planned for hubby. Don't want to spill the beans but it involves chocolate. And I'm going to blog about your giveaway. I love Oil of Olay too! I'm spending Valentine's Day weekend moving my best friend into her new house. I'll be 5 hours away from my hubby so we won't be doing anything on V-Day this year. I did make him some chocolate truffles and gave them to him last weekend. But it's worth it to be apart if I can help my friend! this is a great giveaway. For Valentine's Day I am driving to VA with two of my best friends to see another friend who is stationed there in the Navy. It should be great. My husband and I are taking our youngest son out for seafood. I also plan to bake valentine cupcakes for my son's class party, and assist with the party, as I'm a class mom! My son is home sick today with a virus, so I have already hugged him and kissed him and told him I love him......so I just did it all again! Valentine's day is on a Saturday, so we will probably go out to eat. Unless the weather is nice, then we will go to the lake and BBQ. We're going out to eat as a family. Valentines day in my house is going to be all about hugs and cuddles and maybe some cookie making, too. Great stuff in your shoebox!! I´m hugging (nursing) my baby right now, mmmmm so soft and warm. I am making heart shaped pancakes for the children for breakfast and will make homemade pizza for dinner their favorite thing to eat. Happy Valentine's Day to everyone. Well, my husband requested that I make a lemon cake...don't ask me why he requested that - normally he isn't particular, he just said that he's in a "lemon cake mood," so I guess that will be on the menu! :D Other than that, not much else planned! We'll be staying home for some quality quiet 'us' time. I'll make a nice family dinner, decorate the table and have a special dessert. I've also bought little gifts for my daughters. Then maybe a movie? I just hugged my husband, I hugged my daughter before she left for work about a half hour ago (I always do) and will hug my other daughter when she comes home. We are a family that hugs a lot! My husband and I are going to lunch and doing some shopping! Low key, but fun! Thanks! You are so smart. I love all of these items. All my children are grown so since I won't be seeing them today, I gave them a phone call hug- does that count? I think we are going to a banquet at our church for valentines day and then to a movie afterwards if we are not too tired. Great shoe box! I will be go to a movie with my husband and making a great gift basket for him. Thanks for the giveaway! Just gave both my little guys a big hug and some kisses. Thanks! I'm having friends over for dinner. We are then going to play dominos. I am making heart shaped pancakes for the family. I am cooking dinner for my huby and making a peanut butter cake- his fave. And going to a movie! I don't have kids, but I gave my hubby a hug and a smooch! I love making brownies for my family and then cutting them into heart shapes. I am having a BBQ with my family. Being together and relaxed is what families need. Romance is wonderful, but this day really shows that romance started our wonderful family. We're taking our daughters out for Valentine's Day to Build-a-bear and then to some yummy food! I hugged and kissed my girls. Aww! I am going to be making Valentine Cupcakes. Nice goodies that I could use for sure! We are going out to eat, to a comedy club, and getting a motel room! I night away from my 4 kids and I'm excited!! We're taking our boys out for dinner and a movie. They love pizza so we thought we'd maybe take them to Cassano's for their heart shaped pizza. I just hugged and kissed both of my boys before putting them on the bus for school. There's always lots of hugs and kisses around here! We will be having homemade tacos and a movie with the grandkids. They are super excited. I am hoping to make a fun homemade waffle breakfast and then some creme brulee later in the afternoon. We don't normally do valentine's day, but I've wanted waffles for awhile and it is a good excuse! LOL! We may be going out Saturday night with some friends, but that is to celebrate my birthday which is today! LOL! I hugged my dogs! I don't have any kids! LOL! I am planning alone time with my hubby, maybe a picnic on the floor or a snuggle movie. My husband's working all day and I don't think we'll be doing anything. my dh took the day off from work to celebrate our v-day anniversary! we are going out to eat and go thrift shop shopping with no kids!! I'm baking my husband a cake and then we are going to play some wii and have a wonderful evening! I'm going to go and hug and kiss my 8 month old daughter teeHee! Valentine's Day - my grand son's birthday is the 13th so we'll celebrate his big day but not really V-Day. Maybe just a kiss from the hubby and a card. My grandkids and I have been making valentines like crazy, for school friends, church friend, neighborhood friends, brothers, sisters, aunts, cousins, you get the picture. They love the holiday. We made Valentine's today, my husband and I will be going out of town for the first time in like 5 years for anything other than business. My husband has to work so the kids and i will call him then make dinner for him when he gets home Monday. Valentine's day is just going to be another day around here. My husband and I seem to ignore it every year. Nothing special planned at all. I did buy my kids some chocolates though. My husband is planning something for Valentine's, but he is going to surprise me, so I don't know what I will be doing! I'm going to go give out hugs right now! I'm baking cupcakes and cookies with my son. What a great giveaway! I am going to be working at the hospital on Valentine's day. I will give away free hugs to my patients if they want them. Thanks! for Valentine's day (a week early) we went to the White mountains for skiing. We couldn't get the week of V-day off from work. But we had a great time. What a wonderful giveaway! For valentines we are going to make some cupcakes and handmade Valentines for the family. Thank you! I just hugged my granddaughter and grandson. My kids and I already started our Valentine's Day preparations by decorating cupcakes! What fun! My kids are napping right now but I promise I'm gonna hug them as soon as they get up! A great idea for a giveaway. Hubby and I are spending a quite Valentine's day together. We will have a special dinner prepared by me and then watch video's in the evening. We will exchange our gifts and cards. I don't have kids.........so I hugged my hubby. great idea. I am having six four year olds over to decorate cookies! We don't have anything special planned, just extra hugs and attention for the kids! We are all going to spend time together -- we all came down with the flu at the same time-- all 7 of us. We are also going to a movie, just my husband and I. This may not seem like much but we usually don't do anything. So I am excited. I would love to win this. My family and I are going to bake cupcakes, play games,and watch movies. I made breakfast in bed for my husband and girls. And then I made strawberries and cream and chocolate for dipping after dinner. Life Starring Ellie and Eve Giveaway...a Kajeet! Seeryus Mama Giveaway: A Peek! Barefoot Mommy has great giveaways!